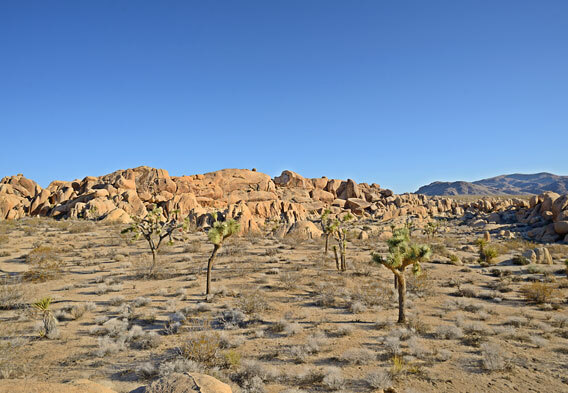 At 794,000 acres, Joshua Tree National Park is larger than the state of Rhode Island. The Colorado Desert (part of the Sonoran Desert) and the Mojave Desert come together at Joshua Tree National Park. The Colorado Desert is classified as a "low" desert, while the Mojave is a "high" desert. Elevations within the park range from 900 feet to over 5,000 feet above sea level. Five fan palm oases can be found in Joshua Tree National Park. They indicate the few areas where water occurs naturally at or near the surface. Joshua Tree National park protects 501 archeological sites, 88 historic structures, 19 cultural landscapes, and houses more than 120,000 items in its museum collections. 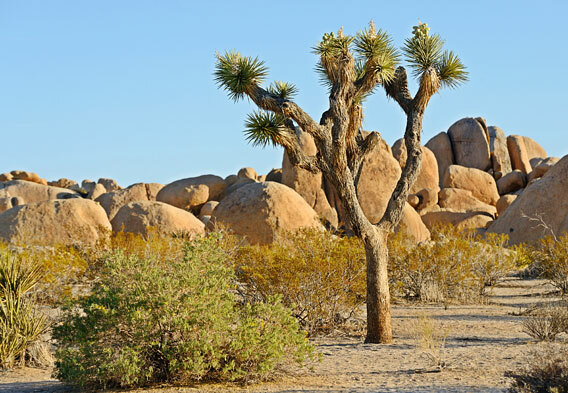 Joshua Tree National Park is found in an area where the geological timeline goes back nearly two billion years. Rolling hills and flourishing grasslands once characterized the now-desert landscape, and there was a time when camels, mastodons, saber-toothed tigers, and wild dogs figured among the resident animals. Humans came to occupy the Joshua Tree National Park area at least 5,000 years ago, each group leaving its mark upon the land and contributing to the park's cultural history. Joshua Tree National Park museum collections are available for visitor viewing and provide wonderful insight into the park's complete story. 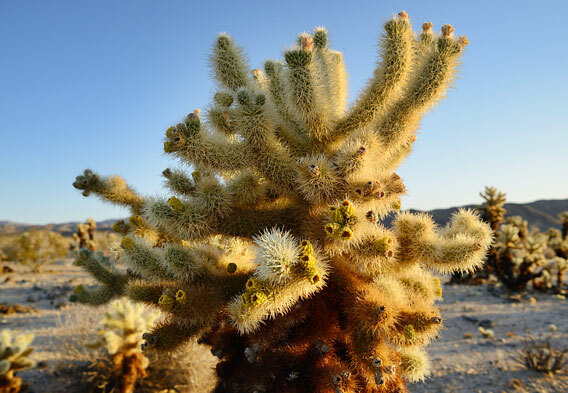 While exploring Joshua Tree National Park, many visitors make it a point to see the Cholla Cactus Garden. Found approximately 20 miles north of the Cottonwood Visitor Center, this attraction is an area where you will find a mesmerizing concentration of cholla cacti. Sure, these cacti are found in other places throughout the park, but nowhere else are they so prevalent. It's quite a sight to see, especially if you visit at a time when the sunlight shines directly on the cacti and seems to set them aglow. Nature walks through the Cholla Cactus Garden can be enjoyed. Just be careful of the needles. They have a rather fierce reputation and have even been known to penetrate shoes and hiking boots. Two deserts come together in Joshua Tree National Park. These deserts are the Mojave Desert and the Colorado Desert (part of the Sonoran Desert). While the park is commonly referred to as having one ecosystem, it more specifically has two because of the different elevations of these deserts. The Colorado Desert is categorized as a "low" desert. Set below 3,000 feet, it encompasses the eastern part of Joshua Tree National Park and is dominated by the creosote bush. The Mojave Desert is a "high" desert and is slightly cooler and wetter. Elevations within the Mojave Desert area of Joshua Tree National Park approach 6,000 feet above sea level. This is the primary habitat for the Joshua tree species, from which the park takes its name. 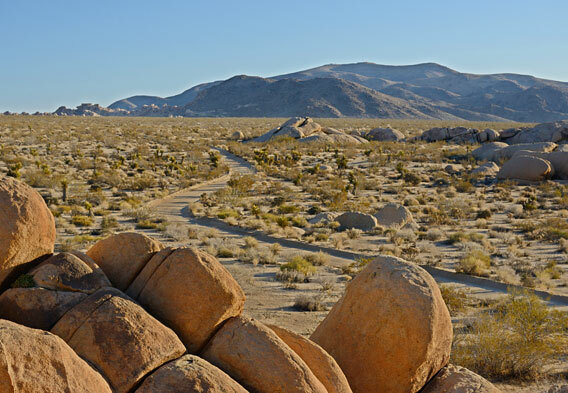 Many visitors to Joshua Tree National Park venture to an interesting area where the Colorado and Mojave deserts meet. Known as the Pinto Basin, this area is well known for its sand dunes. It should be noted that these aren't true dunes. Instead, the natural attraction consists of an elevated ridge that is covered by a modest layer of fine sand. The "trailhead" for the Pinto Basin Sand Dunes is approximately 14 miles north of the Cottonwood Visitor Center on the east side of Pinto Basin Road. There isn't an actual trail to the dunes. You just kind of work your way towards the ridge along a predominantly soft and flat terrain. Getting to Joshua Tree National Park is fairly easy, due in part to the fact that Interstate 10 runs along the park's southern edge. Found just off of this major highway approximately 40 miles east of Palm Springs is the Cottonwood Visitor Center and Park Entrance. Two other Joshua Tree entrances can be found on the northern side of the park along California 62. They include the North Entrance Station in the town of Twentynine Palms and the West Entrance Station in the town of Joshua Tree. The West Entrance Station is the most popular point of entry. For those who are interested in flights to the area, the closest airport to Joshua Tree National Park is the Palm Springs International Airport. To the near southwest of Joshua Tree National Park is an area that is known as the Coachella Valley. Within this area, you will find the well known resort city of Palm Springs. Other cities in the Coachella Valley include Cathedral City, Coachella, Desert Hot Springs, Indian Wells, Indio, La Quinta, Palm Desert, and Rancho Mirage. 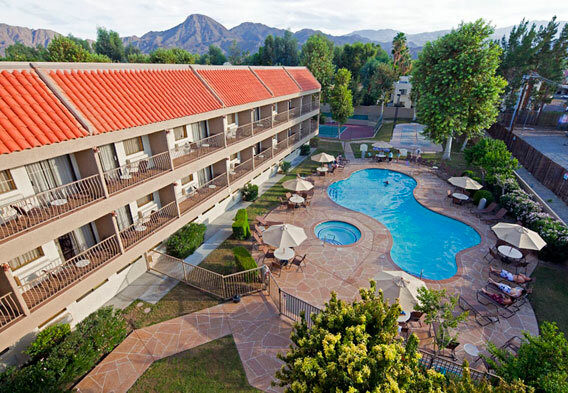 Hotels and motels abound in the Coachella Valley, as do resorts and vacation rentals, so there are accommodations to suit a range of tastes and budgets. Heading up to the northern side of Joshua Tree National Park, the city of Twentynine Palms presents just one more option for where to stay. For those who prefer camping, there are nine campgrounds in Joshua Tree National Park. Visitors can also go backcountry camping, provided that they register at one of the park's 13 backcountry registration boards. Backcountry campsites must be at least one mile from the road and 500 feet from any trail or water source.